This year’s commemoration of the National Independence Day started with the holy mass at St. Adalbertus basilica. Then Mikołów community and guests geathered at the main square. 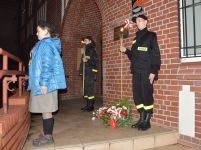 Town authorities and the delegates of Beuningen, Netherlands as well as scouts, firemen and school youth laid a wreath at the memorial boards. The event was ended with a concert of Voccata group in the Town Culture Center. Citizens could also listen to a short performance of a mining brass band and try some pea-soup.